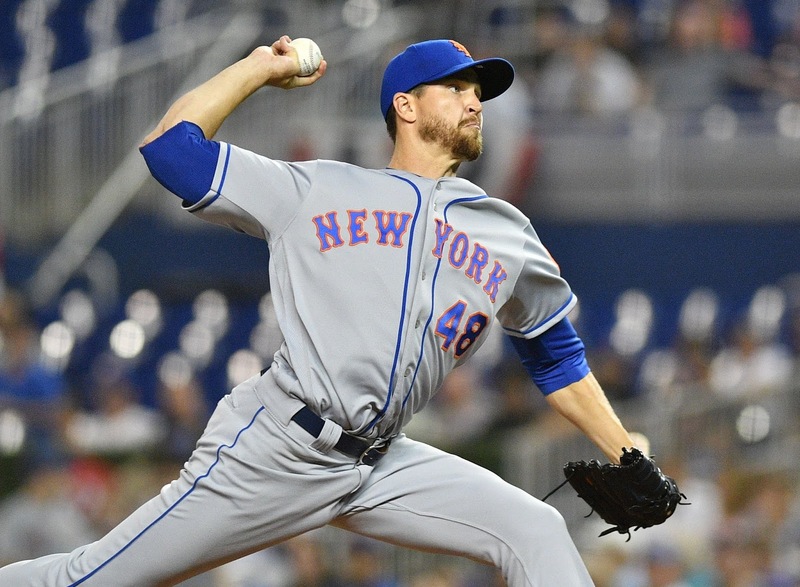 Brooklyn Digest: Callaway on deGrom After Tough Night Vs. Twins: "We found out he's human, finally"
In addition, deGrom threw 13 innings without allowing a run to start the season, and extend his career-high scoreless streak to 26 innings. Mets Manager Mickey Callaway said of deGrom possibly being harder to hit this season, "It seems like it so far. You know, the thing that you can't ever underestimate is, when he was pitching last year, he was not a Cy Young winner. All of a sudden, you're a Cy Young winner, you probably feel a little bit better about yourself because of that work that you put in the year before. He definitely looks better to me so far and the velo (velocity) is definitely better, especially on the offspeed pitches. I think he's - especially the other night (in Miami) with the slider - that's almost unhittable, that's ridiculous. "I think that just getting that extra bit of confidence, and I've always thought this about pitching, when you have confidence, you're going to throw harder. When you don't and you're not trusting your stuff, you're not allowing your body to maximize its potential, and your velo goes down. That's the first thing I look at when somebody's velo drops, or somebody's velo spikes, you know, where are they at mentally, and usually that's the case. Even before something physically or mechanically, it's usually the confidence that makes that one- or two-mile difference." On Tuesday night, de Grom was all set to make his Citi Field debut against the Twins, and Callaway said of this interleague matchup against a team they see every three years, "There are challenges because you haven't seen guys, you know. I think it was similar to Miami when you get some new players you haven't seen before, some young players, and that kind of shows up sometimes when people make their major-league debut against you. "Guys aren't quite sure what they have, how they're going to sequence their pitches, what to look for, and it can make it probably tougher than it should be, so we dig very deep and we make sure that we have as much information as we possibly can. We had our advanced scout come in today personally to kind of walk us through what he saw, so we did go a little bit above and beyond what we normally would for a series because of exactly what you're talking about. "You have to understand what their players can and can't do. (Pitching coach) Dave (Eiland) has seen some of their players a lot (when he was in Kansas City), I've seen some of their players a lot (when he was Cleveland's pitching coach), so we tried to voice what we have seen in the past. "They're a very good ballclub. They've put together a good team over there and they play aggressively, they run the bases aggressively, so we have to do everything right. We've got to get the ball in quick from the outfield and play the game the right way to keep their aggressiveness, kind of, at bay." After a half-hour rain delay, deGrom opened the game with a strikeout of Max Kepler. It didn't take long for the Twins to show that aggressiveness that Callaway talked about when Jorge Polanco laid down a bunt for a hit down the third base line. That moment showed that this could be a different night. The Twins didn't build on that big play, as deGrom got Willians Astudillo to fly out to right, followed Eddie Rosario taking one to the warning track in center field to end the frame. If the first inning was a sign this could be a different night for deGrom, the second inning confirmed it. Mitch Garver launched one to center field that hit the black wall just behind the fence, over the orange line, for a home run to make it 1-0 Minnesota. The Mets tied it in the bottom of the second when Michael Conforto doubled and scored when Amed Rosario hit a double of his own to bring him home. In the third inning, the Twins picked up right where they left off. With one out, Polanco tripled and scored on a wild pitch. Astudillo followed with a single, and he came in on a two-run homer for Rosario. Next up was Garver, and he launched another solo home run to make it 5-1. This was his second of the night, and he became one of the few guys that can say they have had a multi-homer game against Jacob deGrom. The Mets got two of them back in the bottom of the third when Brandon Nimmo got his first home run of the season, followed by a solo shot for Conforto, his third homer of the season. In the Minnesota fourth, Byron Buxton opened the inning with a double, and he came around to score on a single from Kepler to make it 6-3. That was all for deGrom, who allowed six runs (all earned) on eight hits, which included three home runs, and a walk, with three strikeouts. "I was bad out there," deGrom said. "That's all there is to it...I just couldn't locate anything. I was all over the place. My slider wasn't even a factor tonight." Callaway said, "We found out he's human, finally. I didn't think he was for a while." This ended deGrom's incredible run of 26 straight quality starts, which had tied Bob Gibson's all-time record. His last non-quality start was on May 13, 2018, and this was his worst start since September 5, 2017 when he allowed nine runs (three unearned) over 3 1/3 innings against the Phillies. Seth Lugo came out of the Mets bullpen in the fifth and sailed through it, but then in the sixth, Jonathan Schoop launched a solo homer to make it 7-3 Twins. The Mets got a run back in the seventh when Pete Alonso hit a solo homer, his fourth of the season, to make it 7-4. The Twins put it away in the eighth against Mets reliever Robert Gsellman when Buxton doubled and scored on an error by Alonso, followed by a two-run homer for Polanco to make it 10-4. In the ninth, the Mets turned to Jason Vargas, who mostly works as a starter to finish it up. He didn't have it, as he allowed four runs, including a three-run homer for Schoop, his second of the night, which made it 14-4. In the bottom of the ninth, the Mets mounted a rally against Twins reliever Chase De Jong, the seventh pitcher they used in the game. Alonso hit a two-run shot to left center that made it 14-6. This was his fifth of the season and the first multi-homer game of his career. They added a pair when Jeff McNeil then worked out a bases-loaded walk and a run came in on a fielder's choice by Travis d'Arnaud that made it 14-8. The Twins put on quite a power display, as he had 17 hits, including six home runs, not what you would have expected on a night they were going against a Cy Young winner, which proves anything can happen in baseball.